Yeah, that’s right: milchtoast. Never heard of it? Okay, then, I’d better explain. I learned the word milquetoast a few years ago, through one of the “Word of the Day” e-mail services that I use. I have long since deleted the e-mail, but the essence of it has stuck with me. 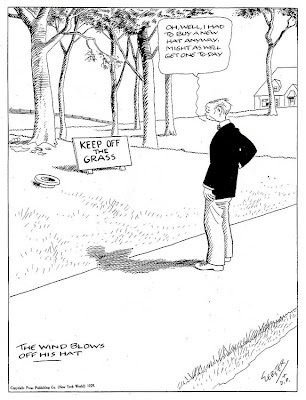 Merriam Webster defines milquetoast succinctly as “a timid, meek, or unassertive person.” A further look into the origins of the word reveals that it is an eponym, derived from a comic strip from the 1920s, entitled The Timid Soul. Said comic strip starred a character by the name of Caspar Milquetoast, whose name was chosen by illustrator/author H.T. Webster as a play on milk toast, now celebrated as a comfort food but in Webster’s day derided as a bland and boring dish suitable only for children and invalids. Think of Caspar Milquetoast as a sort of Chuck Norris of the meek and timid. Webster described his character as “the man who speaks softly and gets hit with a big stick.” How meek and timid is he? 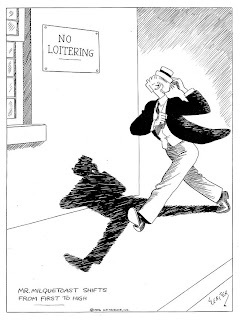 So meek and timid that he runs past “no loitering” signs; declares his hat a goner when it blows onto grass with a “keep off” sign; and is hypersensitive to rules. The point of all this (aside from the fact that looking at old comic strips is fun) is that ever since I arrived in Switzerland two days ago, I have been feeling every inch a timid soul or milquetoast. Except we’re in German-speaking Zürich, where milk is milch, so I’ve adapted the term to suit my context. As a milchtoast, I start sweating at the supermarket, afraid that the conversation with the cashier will involve something outside of a simple greeting, the amount of money to be paid, and a farewell. I am unsure of how to cross the street (laugh if you will, but it’s different here). I see bold “VERBOT” signs scattered around the city, and worry that I could inadvertently be breaking some unknown rule. Zürich will be my home base for the next two years, at least. During this time, I do plan to explore and eat my way around Switzerland and Europe, and I hope to share culinary and other life adventures with you here. But in doing so, I have to go against my tendencies somewhat, for I am a homebody and a bland food lover by default. So far, the best things I’ve had to eat here in Zürich are bread and milk, so I’m really not that far away from combining them into milk toast. In fact, I love the Swiss milch so much that I plan to devote an entire post to it, perhaps tomorrow. CAN’T YOU READ THE SIGNS?? I know just how you feel! getting the hang of crossing the road in the UK was a scary! hopefully once you get a better grasp of the language interacting and getting through daily life will get easier! I think everyone loves canadians so you’ve already got a leg-up 🙂 viel glück! !